Current day college sports is facing an arguable subject should college athletes be individually sponsored? Many college athletes seek payment from a 3rd party to wire them money, we must not quickly judge from the reports. There comes many variables with why the student athletes even received money; many of the victims have stated that they asked for money because they are either supporting there family or it was out of there control -meaning there parents did it behind there backs. There is also some cases where athletes dont intent to break the rules and just leave the NCAA league early. Ex-college athlete Demar Derozan, was getting lavished with free clothing, shoes and housing from University of Southern California. But he wasn’t making money off of NCAA or College hoops to support his family. In 2009 his mother Diane, was diagnosed with lupus, a complex autoimmune disease that causes the immune system to turn against the body and attack healthy tissues or organs. At this point is his life Demars “Free tuition, Free housing, meal plans, books, tutoring, or nutritional advice” couldn’t pay for his dying mothers medical bills, the University would only cover his Healthcare. Demar had to make the choice of entering the NBA draft after his freshman year at USC in order to pay for his mothers medical bills, in the NBA even rookie receive some payment of money. If the NCAA would allow college athletes to be individually sponsored, companies like Nike. Spalding, Gatorade and Klipsch speakers and headphones, Could of signed with Demar earlier on, therefore he would of stayed at USC for a couple of more years possibly. Silas Nicita had no intention of making money while at college, but the NCAA punished him for pursing his dreams of playing football at the collegiate level. Nicita was born into a rough family in Bakersfield, California. Nicita wanted to leave the state after high school due to rough relations with his mother, so he played his first year of College football at Cornell University in Upstate, New York. The next year he decided to leave Cornell and attend Baylor University in Waco, Texas. Nicita practiced with the team in 2013 but had to soon leave before the season started because he wasn’t able to pay for schooling. The same year, a friend who Nicita titles “Papa Joe” offered to pay for Nicita schooling, housing and food because he recognized Nicitas will and determination to play football at Baylor. 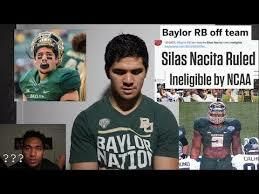 The NCAA and Baylor both had a problem with Nicita being “privately sponsored” as a student athlete. This scenario is such a problem because Nicita was basically being punished due to the fact that he couldn’t pay for College by himself, as a student athlete he kept the promise of keeping his grades to the NCAA standard and not participating in any harmful out of school activities. Nicita didn’t dream to hurt the Universities title and did everything right except for being sponsored by another family that recognized his determination. As we see your topic come up with the FBI, I am very interested to read your opinion. The illegal money in the game right now is crazy and it is all due to a fundamental difference in what we consider these players to be, are they students or are they athletes. Nobody is able to do something 50-50 successfully so they are one or the other. If they are students then they should be able to be paid if they are doing work for the university (playing football) If they are athletes then the next level should be able to hire them whenever they want to (even after the freshman year of high school) because that’s how businesses work. These are not students and should be treated like employees. I really enjoy reading about your topic, because today in the sports worlds it is such a big deal. I believe the NCAA is one of the most corrupt industry and it is a tragedy that individual players can not make money off their likeness. I think college sports have actually lost in the fact that instead of staying in the NCAA they jump to the pros to make money. I think if they were able to pay players the NCAA fan base would increase. I really makes me think what goes on behind the scenes and how players get paid against the rules for example Deandre Ayton and the University of Arizona. I recently watched a documentary on Lebron James and the publicity and money/material he got was crazy. We had never seen such a phenomenon like Lebron, but today we understand what goes on and I think there is time for change. I really like the idea for your argumentative research paper. It is a subject that has seen a lot of controversy in recent sports news and I believe that they might as well pay athletes if they are already receiving such perks of free tuition, housing, etc. It is sad having to watch student athletes with so much potential have to go to the league early instead of developing in college because they have to support their family or have other circumstances that will hinder their performance at the next level. All in all, you have a very intriguing article and I found an article that you may enjoy. It talks about the various pros and cons that paying college atheletes can bring.